Daredevil is besought on all sides by faceless foes, competent in combat but heartless. Such is true not only of The Hand’s generic gaiden’s lack of empathy for their victims, or even their ability to mask their heartbeats, but of the series’ second season itself. Daredevil’s main flaw is that it lacks a central antagonist such as Wilson Fisk or Kilgrave that made the first season and Jessica Jones so inspired, respectively. True, Fisk has his requisite cameos, which thanks to Vincent D’Onofrio and his menacing monologues are the highlight of their episodes, but the rest of the rogues gallery has ballooned too quickly, none of whom drive the action so clearly as Kingpin or Kilgrave. What remains is thirteen hours of well choreographed fight scenes without an emotional payoff and extended meditations on the morality of vigilanteism without a satisfying answer. The presence of antiheroes such as the Punisher and Electra give occasion for Murdock to dialogue on and defend his methodologies and the moral reasoning which underlie them, specifically his aversion not only to vengeful murder but all killing, even the retributive justice of the death penalty (which first inspires his defense of Frank Castle, despite the later’s obvious difference of opinion on the matter). Such clearly follows from his Catholic faith, or at least his upbringing in such. Beyond mere dogmatism, however, his rational is that all men posses goodness and are capable of redemption. Such echo Catholic theology, specifically doctrines such as the Imageo Dei and Penance, and while Murdock’s make no appeal to a deity, they’re equally founded on (blind) faith. Much of his rhetoric resembles that of brighter heroes such as Superman, but Daredevil’s deeds remain dark. Apart from Electra and Punisher, he makes no attempt to have hope for or see (hear?) goodness in his adversaries, much less offer them a path towards redemption. The former fights on the side of the angels (or devil in this case) for about as long as Vader had turned toward the light before “turning to the light.” The latter is more than a defeat for Daredevil; not only did he fail to dissuade the Punisher from executing his enemies, by season’s end Murdock had conceded Castle’s point that “some men just need killing,” at least with respect to one particularly dangerous enemy. And therein lies the problem with Castle’s doctrine. While its certainly the case that capital crimes merit capital punishment, his own calculation in deciding to dispense such punishment includes consequential considerations. He asks not only whether an individual has committed a wrongdoing which warrants retributive justice to be delivered, but also whether the world would be a better place in such an individual’s absence. The difference being the latter is byong the purview of any men or even all men, whereas the of former each and every man is capable. Indeed, such is the exact question posed to every jury which has ever convened. After all, the rights ascribed to groups are merely extensions of the same rights which individuals intrinsically inhere. As he’s done his due diligence in establishing the guilt of his targets beyond a reasonable doubt, Frank Castle is in the same rights as any jury in passing judgement on the lowlifes he turns to no-lifes. He is the justice system writ small into a single man, whom the show (whether intentionally or not) establishes as both more accurate in his judgements and more effective in his methodologies. Through his infallibility the message of the season is that vigilanteism is indeed preferable to the policies and procedures of the police and prosecutors of the real world, regardless of any dialogue from Murdock to the contrary. 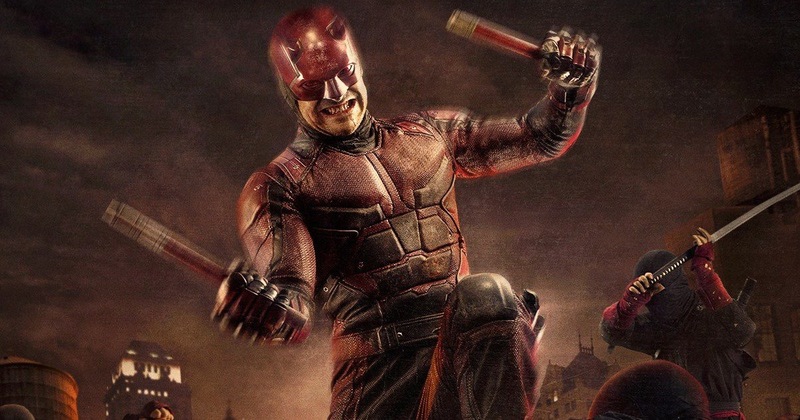 Would it still be morally wrong for Daredevil to likewise assassinate his adversaries? Without condemning such, he is to be commended for neutralizing nemeses through non-lethal methods, not as a matter of mercy, but of humility – acknowledging that serving as judge, jury, and executioner is an extensive and trying task beyond the capabilities of most individuals, himself included. Moreover, Daredevil never kills in self-defense because he, like Batman, has trained beyond chance or happenstance. He is so fully in control of every situation he encounters that not only is his own life not on the line, be neither are the live of those he’s beating just to the brink of death. This is demonstrated wonderfully in one of the few true highlights of this season. In the third episode, “New York’s Finest,” Daredevil engages an entire gang of bikers in another of the long, uninterrupted single-shot fight scenes similar to such in the first season. It adds nothing new, but it’s a cool gimmick that’s used sparingly enough that its yet to become tiresome. A similar scene, not a single shot but far more visceral and violent, takes place in the ninth episode, “Seven Minutes in Heaven,” wherein Frank Castle decimates an entire cell block of hardened thugs. Electra is sadly missing any encounters of a similar caliber; her fights are mostly against the above mentioned gaiden goons, with the ninjutsu demonstrated by her and her opponents alike slightly too choreographed to instill the same weight and realism as those with Daredevil and Punisher. Élodie Yung, despite such, is nevertheless the breakout star of the season. Jon Bernthal is serviceable as Frank Castle, every bit as much if nor more so than Charlie Cox as Matt Murdock, but neither has become the embodiment of the definitive version of their respective characters, as D’Onofrio has with Fisk. And while Yung may not challenge the Greg Horn version of the character as definitive in the minds of comic readers, she did take ownership of the character despite being garbed in the worst adaptation of a superhero’s outfit since Snyder forgot Superman’s red trunks. 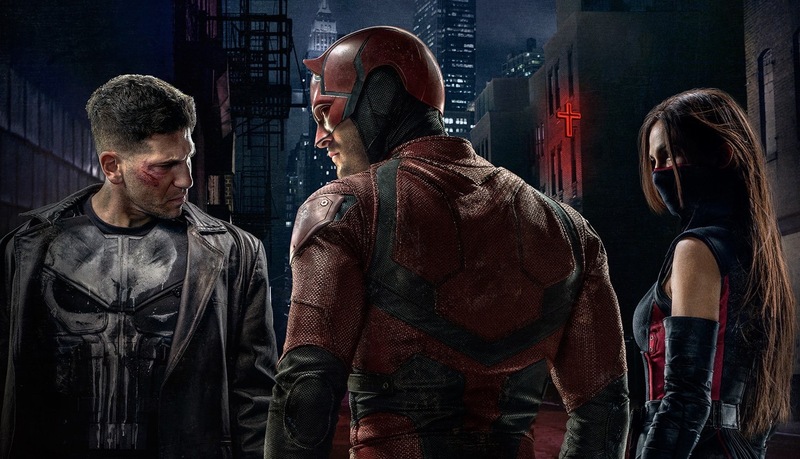 It may seem as if Daredevil Season Two is a disappointment, but such is only relative to the high standard set by Season One and Jessica Jones before it. Had it had a singular villain on the as cool and captivating as Kilgrave or Kingpin, and had it had more coherent statements to say about the moral line of vigilanteism, it might have proven Marvel’s best offering so far, on the silver screen or the small. As it stands though, if I want to experience a truly fantastic tale of a vigilante named Matthew, I’ll go back to rereading my memoirs. March 24, 2016 in Television.